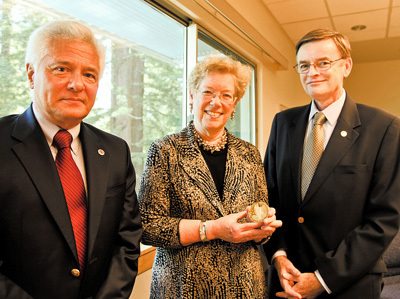 UCSC astronomer Sandra Faber (center) received the 2012 Catherine Wolfe Bruce Gold Medal from William Gutsch (left), board president of the Astronomical Society of the Pacific, and ASP executive director James Manning (right). Photo by Carolyn Lagattuta. The Astronomical Society of the Pacific (ASP), one of the oldest and most respected astronomy societies in the United States, has awarded the 2012 Catherine Wolfe Bruce Gold Medal to Sandra Faber, University Professor of astronomy and astrophysics at UC Santa Cruz. The award recognizes Faber for her lifetime achievements in astronomical research. ASP executive director James Manning and ASP board president William Gutsch came to UC Santa Cruz on Thursday, May 31, to present the medal to Faber in a ceremony at the Center for Adaptive Optics. "Professor Faber has influenced observational cosmology in extraordinary ways over the past 30 years," Manning said. "We are very pleased to recognize her achievements and hope that her remarkable career serves to inspire those who wish to explore and seek greater understanding of our world and the worlds around us." UCSC Chancellor George Blumenthal also attended the ceremony. "Sandy Faber's pioneering research has had enormous influence on our understanding of the universe," said Blumenthal, a professor of astronomy and astrophysics. "In addition to making important discoveries on the formation of galaxies and the evolution of the universe, she has been a leader in the development of new telescopes and astronomical instruments that continue to yield new insights." Faber earned her bachelor's degree in physics at Swarthmore College in 1966 and her Ph.D. in astronomy at Harvard University in 1972. Since 1972, she has worked at UC Santa Cruz and with the UC Observatories, contributing fundamental advances in the understanding of dark matter, the formation of galaxies and black holes in galactic cores, and the large-scale structure of the universe. With colleague Robert E. Jackson, she discovered the "Faber-Jackson relation," which related the orbital velocities of stars in galactic centers to their luminosities, providing a means for estimating distances to galaxies. Faber and collaborators discovered "The Great Attractor," a localized concentration of mass toward which the Milky Way and neighboring galaxies are being pulled, and conducted ground-breaking research on super-massive black holes in the centers of nearly all nearby galaxies. In 1979, Faber wrote a review establishing the notion that galaxies must be surrounded by invisible halos of "dark matter," and subsequently worked with several colleagues to develop a comprehensive picture of galaxy evolution in which the gravitational pull of dark matter is essential to the formation of galaxies and in shaping the large-scale structure of the universe. Faber's role in developing new instrumentation has included serving as a member of the Hubble Space Telescope's Wide Field Camera team, assisting in the diagnosis of Hubble's mirror flaw after launch, and serving on the team that proposed the successful recovery strategy that restored Hubble's potential. She also led the development of the Deep-Imaging Multi-Object Spectrograph (DEIMOS), used with the Keck Observatories in Hawaii to survey the physical properties of distant galaxies, and is a leader of major efforts with both Hubble and Keck to survey thousands of distant galaxies to characterize and document the evolution of galaxies over the history of the universe. "It's hard to find words to express the amazement and pleasure that news of receiving the Bruce award has given me," Faber said. "Reading a list of previous winners is like reading a Who's Who of great astronomers of the twentieth century astronomy. It is an additional pleasure to note that I am following in the footsteps of seven previous Lick Observatory/UCO astronomers who have won this medal, including, most recently, Don Osterbrock, Robert Kraft, George Herbig, and Albert Whitford. The Bruce Medal is truly the thrill of a lifetime." Established by Catherine Wolfe Bruce and first awarded in 1898, the Bruce Medal has honored many of the most accomplished and influential astronomers of the past century, a period of extraordinary change in human understanding of the universe. Founded in 1889 in San Francisco, the ASP's mission is to increase the understanding and appreciation of astronomy by engaging scientists, educators, enthusiasts and the public to advance science and science literacy. The ASP publishes both scholarly and educational materials, conducts professional development programs for formal and informal educators, and holds conferences, symposia and workshops for astronomers and educators specializing in education and public outreach. The ASP's programs are funded by corporations, private foundations, the National Science Foundation, NASA, private donors, and its own members. Information about the ASP can be found online at www.astrosociety.org/about.html. More information about the society's awards and past winners can be found at www.astrosociety.org/membership/awards/awards.html.